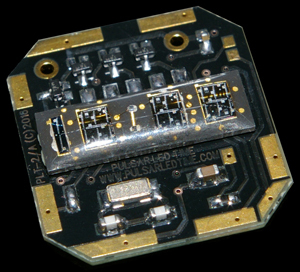 The PLT-2 module will replace a faulty broken and non-working modules of the Classic 1970’s Pulsar P4 & Pulsar P4 Executive models with or with-out the Auto-Command Function or better known as the Flick-Wrist Function as well as the Pulsar Big Time vintage LED watches with Red or Green type LED Displays. 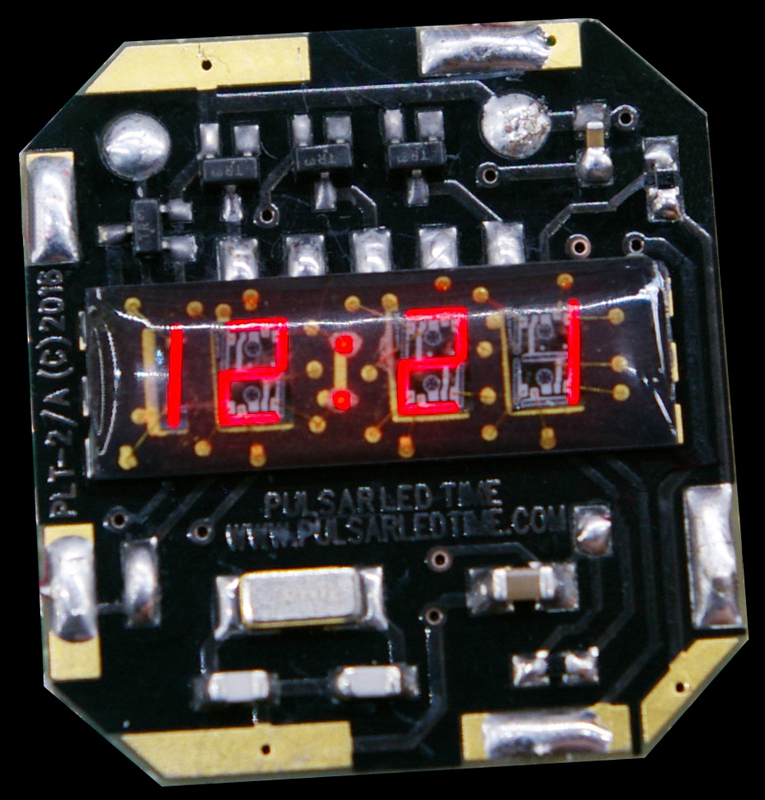 The original magical LED display from your un-repairable LED watch along with the magnetic reed switches and the plastic carrier are removed from the faulty watch and re-used with the new PLT-2 module, ensuring the same 70's LED looks and function. 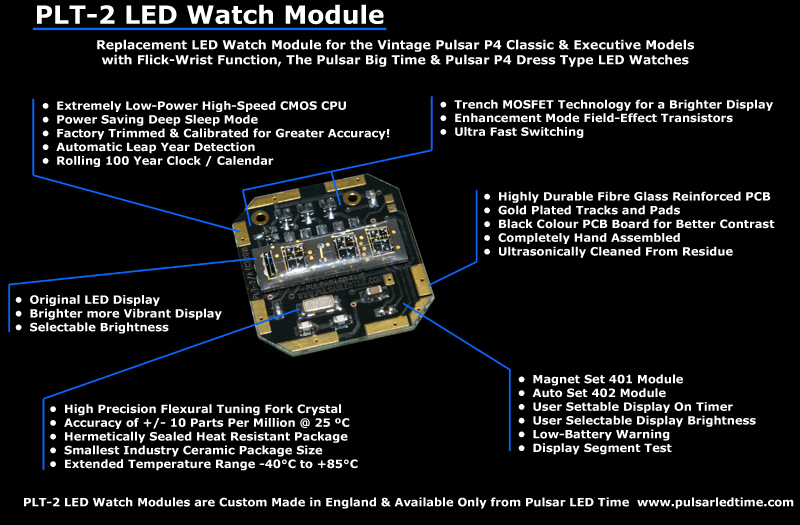 Using the best of what modern technology is able to offer we have recreated all the functions of the original Pulsar P4 LED watch module. The modern Ultra Fast Trench MOSFET Enhancement Mode Field Effect Transistors LED display drivers deliver a bright, crisp LED display across all display segments. We Guarantee the PLT-2 Modules against defects for a period of 18 months from the date of purchase, regardless of the owner. We maintain a database of PLT-2 serial numbers to facilitate this. 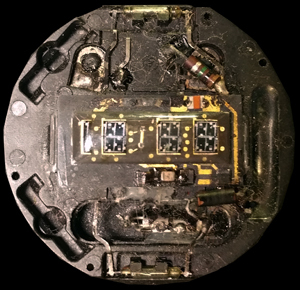 This Guarantee does not include old parts re-used from your old module and transplanted on the PLT-2 module. Recommended batteries to use with the new PLT-2 and the original modules are Genuine Swiss made Renata Silver Oxide type 357 (SR44W) 1.55 Volt Batteries or Energizer type EPX76 1.55 Volt High Drain Silver Oxide Batteries, not cheap copies from far east! 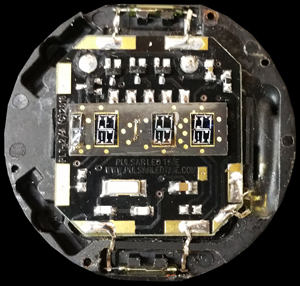 You have to send us your faulty watch or module, we would try to reliably fix your watch / Module first, failing that as long as the LED Display is good in your watch we can replace the module with the new PLT-2 module and get it working. We would remove the Original LED Display from your old faulty module and transplant it on to the new PLT-2 module, then we would insert this new module on to the plastic carrier along with the reed switches that your old module came with to ensure you get your own parts from the old module back and not some ones else's old parts also it ensures correct reed switch alignment for the buttons. The new PLT-2 Module costs £100 Pounds, and includes all the work needed to remove and transplant your old parts on to the new PLT-2 module. We also stock Genuine Swiss made Renata Silver Oxide batteries at the cost of £4 Pounds each. If required, a set of rubber battery spacers will be supplied for free when purchasing batteries. There is no charge other than shipping costs back to you if its not possible to fix your watch. Payment can be with PayPal, Pounds Sterling Cheque or Bank Transfer. No need to pay anything yet until the Watch / Module is fixed and ready to be shipped back. Product Rating "Please only rate if you have tried the module"